A chemical formula is a concise way of expressing information about the atoms that constitute a particular chemical compound. It is also useful for showing how a chemical reaction takes place. For a molecular compound, the chemical formula gives the chemical symbols for the constituent elements and indicates the number of atoms of each element found in each molecule of that compound. If a molecule contains more than one atom of a particular element, this quantity is indicated using a subscript after the chemical symbol (although nineteenth century books often used superscripts). For an ionic compound or other non-molecular substance, the subscripts indicate the ratio of elements in the compound. In chemistry, the empirical formula of a chemical is a simple expression of the relative number of each type of atom in the molecule or the ratio of elements in the compound. Empirical formulas are the standard for ionic compounds, such as CaCl2, and for macromolecules, such as SiO2. An empirical formula makes no reference to isomerism, structure, or absolute number of atoms. The term empirical refers to the process of elemental analysis, a technique of analytical chemistry used to determine the relative percent composition of a pure chemical substance by element. Consider the formula for hydrogen peroxide. Each molecule of hydrogen peroxide consists of two atoms of hydrogen and two atoms of oxygen. Its molecular formula (explained below) would be written as H2O2, but its empirical formula is simply HO, expressing the 1:1 ratio of component elements. In the case of hexane, each molecule has six atoms of carbon and 14 atoms of hydrogen. The ratio of carbon atoms to hydrogen atoms is 3:7, and its empirical formula is therefore written as C3H7. In this case, the molecular formula is the same as the empirical formula. A chemical formula may also supply information about the types and spatial arrangement of bonds in the chemical, though it does not necessarily specify the exact isomer. For example ethane consists of two carbon atoms single-bonded to each other, with each carbon atom having three hydrogen atoms bonded to it. Its chemical formula can be rendered as CH3CH3. If there were a double bond between the carbon atoms (and thus each carbon only had two hydrogens), the chemical formula may be written: CH2CH2, and the fact that there is a double bond between the carbons is assumed. However, a more explicit and correct method is to write H2C:CH2 or H2C=CH2. The two dots or lines indicate that a double bond connects the atoms on either side of them. Although isotopes are more relevant to nuclear chemistry or stable isotope chemistry than to conventional chemistry, different isotopes may be indicated with a left-hand superscript in a chemical formula. For example, the phosphate ion containing radioactive phosphorus-32 is 32PO43-. Also, a study involving stable isotope ratios might include 18O:16O. A left-hand subscript is sometimes used to indicate redundantly, for convenience, the atomic number. The structural formula of a chemical compound is a graphical representation of the molecular structure showing how the atoms are arranged. The chemical bonding within the molecule is also shown, either explicitly or implicitly. There are three common representations used in publications, condensed, Lewis type, and line-angle formulas. There are also several formats used for structural representation in chemical databases, such as SMILES, InChI, and CML. Unlike molecular formulas or chemical names, structural formulas provide a very powerful representation of the molecular structure. Chemists nearly always describe a chemical reaction or synthesis using structural formulas rather than chemical names, because the structural formulas allow the chemist to visualize the changes that occur. Many chemical compounds can exist in different isomeric forms that have different structures but the same overall chemical formula. A structural formula indicates the arrangements of atoms in a way that a chemical formula cannot. A simple example of this may be seen with the hydrocarbon butane, which has the molecular formula C4H10. The four carbons may be arranged in a linear pattern, or in a branched, "T" pattern. The first arrangement is known as orthobutane or n-butane, while the second is isobutane. There are three main types of structural formula in widespread use in the chemical literature. Condensed formula In early organic chemistry publications, where use of graphics was severely limited, a text-based system arose to describe organic structures in a line of text. Although this system tends to break down with complex cyclic compounds such as strychnine, it remains a convenient way to represent simple structures such as ethanol (CH3CH2OH). Skeletal formula Note that for organic compounds, line drawings of structural formula are assumed to have carbon atoms at the vertices and termini of all line segments not marked with the atomic symbol of an element (other than carbon). Each carbon atom is in turn assumed to bear enough hydrogen atoms to give the carbon atom four bonds. Equivalent full and abbreviated forms are shown in the adjacent figures. A chemical structure can be precisely, uniquely, and unambiguously described using IUPAC nomenclature. In the case of isobutane, the IUPAC systematic name is methylpropane. 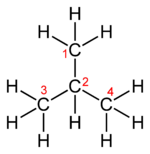 Multiple planes When substituents of a molecule exist in different planes, their position can be described using solid and dotted wedges, with the former showing a substituent coming out of the plane, and the latter going into it. This system is useful in describing differences between chiral molecules. Chemical formulas most often use natural numbers for each of the elements. However, there is a whole class of compounds, called non-stoichiometric compounds, that cannot be represented by well-defined natural numbers. Such a formula might be written using real numbers, as in Fe0.95O, or it might include a variable part represented by a letter, as in Fe1–xO. The chemical formula used for a series of compounds that differ from each other by a constant unit is called a general formula. Such a series is called a homologous series, and its members are called homologs. By sorting formulas according to the number of atoms of each element present in the formula according to these rules, with differences in earlier elements or numbers being treated as more significant than differences in any later element or number—like sorting text strings into lexicographic order—it is possible to collate chemical formulas into what is known as Hill system order. The Hill system was first published by Edwin A. Hill of the United States Patent Office in 1900. ↑ L. G. Wade, Organic Chemistry, 4th ed (Upper Saddle River, NJ: Prentice Hall, 1999, ISBN 978-0139227417), 17-20. This page was last modified on 8 February 2017, at 15:22.